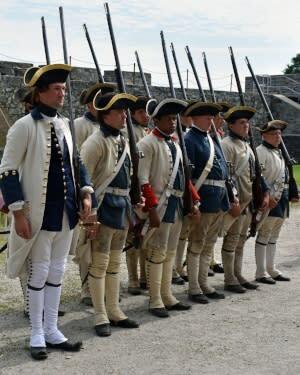 Ticonderoga, NY – Fort Ticonderoga’s “Fort Fever Series” continues on Sunday, February 11, at 2:00 p.m. with a program on “Soldiers of Color at Ticonderoga” presented by Stuart Lilie, Vice President of Public History and Operations. During this program, explore the diversity of soldiers who fought at Ticonderoga and examine how attitudes about soldiers of color varied dramatically within the numerous armies and empires that held Ticonderoga. This program is part of the National Black History Month celebration. The Fort Ticonderoga Association is an independent nonprofit educational organization and museum, which serves its mission to ensure that present and future generations learn from the struggles, sacrifices, and victories that shaped the nations of North America and changed world history. It serves this mission by preserving and enhancing its historic structures, collections, gardens and landscapes; and educating the public as it learns about the history of Fort Ticonderoga. Welcoming visitors since 1909, it preserves North America’s largest 18th-century artillery collection, 2000 acres of historic landscape on Lake Champlain, and Carillon Battlefield, and the largest series of untouched 18th-century earthworks surviving in America. Fort Ticonderoga engages more than 75,000 visitors each year and offers programs, historic interpretation, boat cruises, tours, demonstrations, and exhibits throughout the year and is open for daily visitation May through October. Fort Ticonderoga is accredited by the American Alliance of Museums and pursues its vision to be one of the premier cultural destination in North America. Visit www.FortTiconderoga.org for a full list of ongoing programs or call 518-585-2821. Fort Ticonderoga is located at 102 Fort Ti Road, Ticonderoga, New York.